Herodes Atticus ( ), also known by his Roman name, Lucius Vibullius Hipparchus Tiberius Claudius Atticus Herodes Marathonios (ca. 101-177) was a Greek rhetorician, notable as a proponent of Philostratus' Second Sophistic, a pseudo-revival of classical Greek culture. He was born in Marathon in Attica to a distinguished and fabulously wealthy family; His grandfather, Hipparchus (born 40), was estimated to have a fortune of 100 000 000 sesterces and was the richest man in the Greek World at the time. The emperor Domitian took it away and possibly had him murdered. His father, Atticus (born 65), lived modestly until the accession of Nerva in 96, when he "found" part of the treasure hidden in the ruins of a house. With this he purchased a seat in the Senate (98) and served as governor of Judaea, thus restoring the family's status. Herodes claimed lineal descent from Cimon, Miltiades, Theseus and Cecrops, as well as Aeacus and Jupiter. Herodes (Juvenal, Satire III), received an education in rhetoric and philosophy. Hadrian appointed him prefect of the free cities in Asia in 125. Herodes returned to Athens , became famous as a teacher, and was elected archon. In 140 Antoninus Pius brought him to Rome to educate Marcus Aurelius and Lucius Verus, and as a mark of favor appointed him consul, in 143. 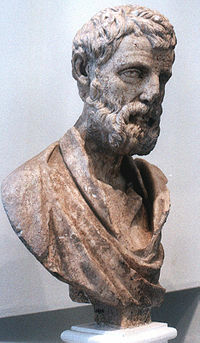 Herodes was married to Aspasia Annia Regilla. The couple are considered great benefactors of the city of Athens and are commemorated in Herodou Attikou Street and Rēgíllēs Street and Square, in downtown Athens. Herodes was the teacher of three notable wards or students: Achilles, Memnon, and Polydeuces (Polydeukes), his boyfriend. Herodes was criticized for erecting statues of these protégés in the guise of classical athletes. Gibbon: A History of the Decline and Fall of the Roman Empire. Suetonius, Life of Vespasian 13. Philostratus, Lives of the Sophists 558.